The largest expansion in Magic Kingdom® Park history is underway, a project that will nearly double the size of Fantasyland and deliver a new home for Ariel, new ways to interact with favorite Disney princesses, an exciting new family coaster, a double dose of Dumbo and more. Contact us for details and to plan your next Disney vacation! For the ultimate Disney experience, why not combine your visit to Walt Disney World with a cruise onboard Disney Cruise Line? Celebrate your love of Disney with the whole family! 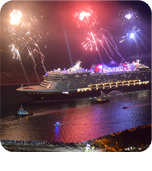 Fireworks, water pageantry and cheering fans greeted the newest ship in the Disney Cruise Line® fleet as it arrived for the first time at Port Canaveral, Fla. Hundreds of people lined the shores before sunrise to catch a glimpse of the Disney Dream™, which features the first water coaster at sea and other innovations. Meanwhile, the Disney Wonder® departs soon for its new home on the West Coast.